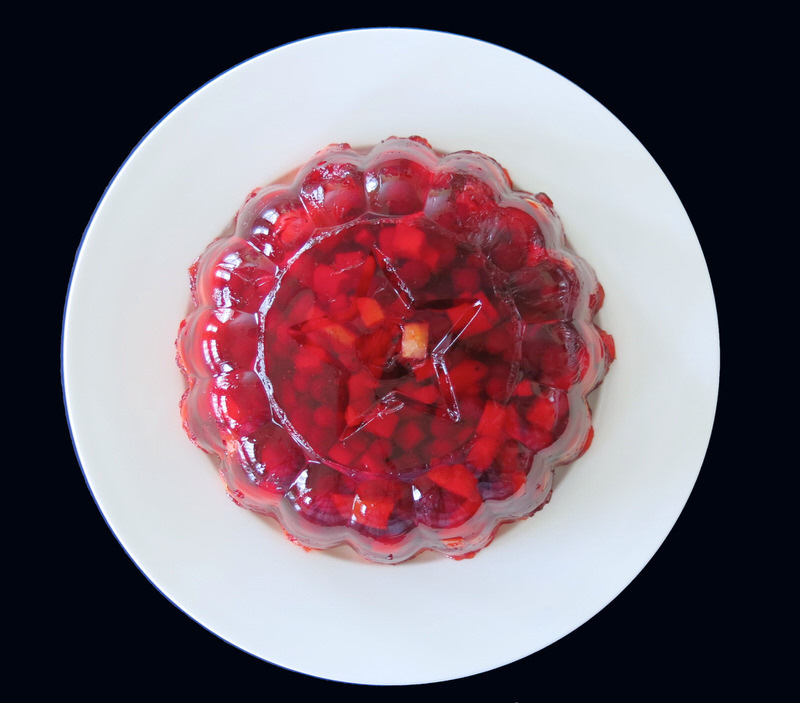 Partridgeberry Jelly Salad? Oh, back to the 70’s you say? 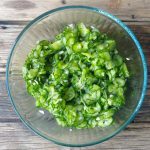 That was the era of the jelly salad explosion, wasn’t it? I was there. I should know. 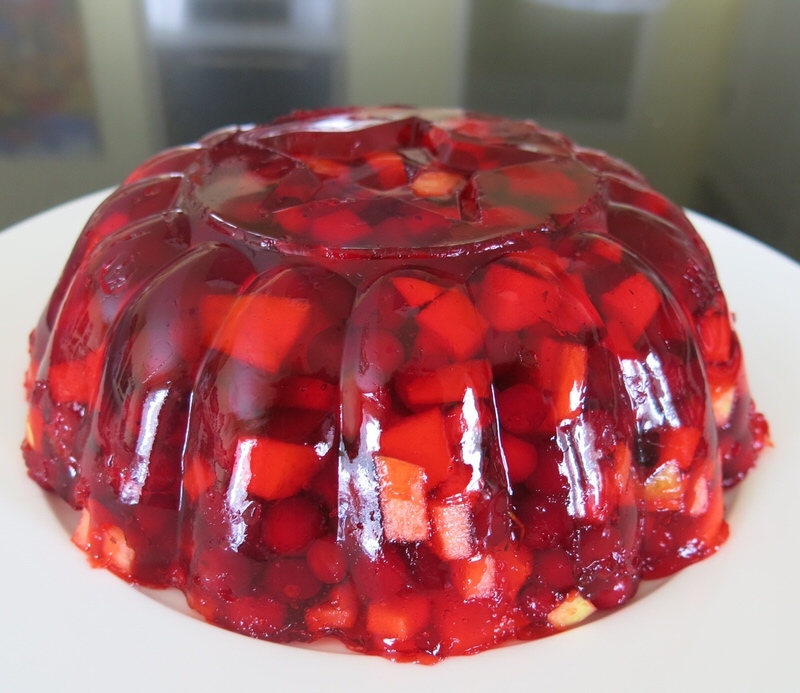 I hadn’t had made or eaten a jelly salad for over 20 years, but this bejewelled globe is completely irresistible and such a lovely compliment to rich dark turkey. I made it last Christmas for the first time, after being gifted with a generous amount of partridgeberries by my gal pal, Emily Mardell. 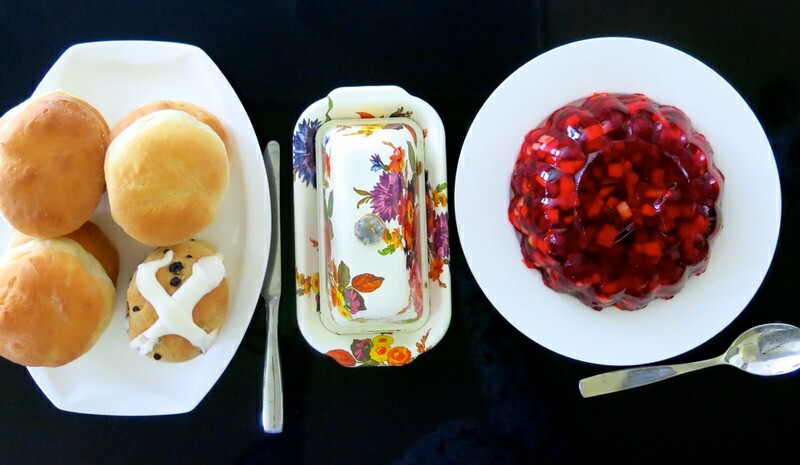 Visiting Newfoundland in 2014, I was introduced to the Partridgeberry by Tineke Gow at the Artisan Inn in Trinity NL. She actually sent me home with a jar of her famous Partridgeberry Jam. I yet to write about staying at her dreamy property. Sometimes the most precious memories are the most difficult to convey. 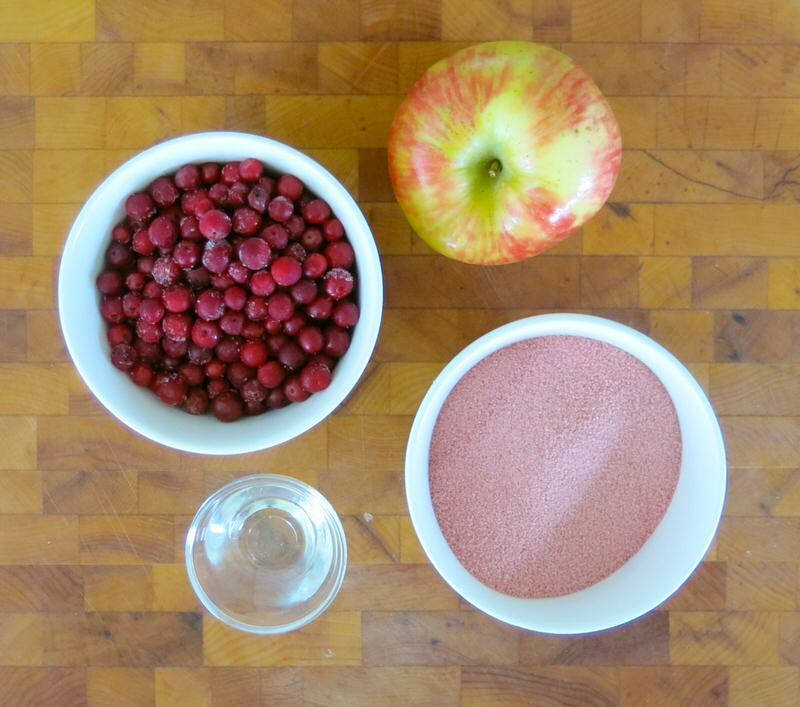 Emily and I bonded last year over our shared passion for the Partridgeberry. 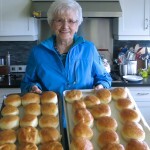 We spend a day in the kitchen with her mom, Joy, and daughter, Cela, making jam, the famed and delicious Newfoundland White Bread, Toutons and Fried Cod Tongues. During that time, I learned of this esteemed family recipe that traditionally accompanies all turkey dinners “at home”. 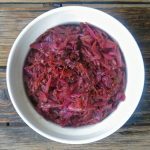 When Joy sent me the recipe, I giggled. So simple. Can it really be “that irresistible”? Oh, yes it can. Ask my mom. Ask my daughter. Ask me. 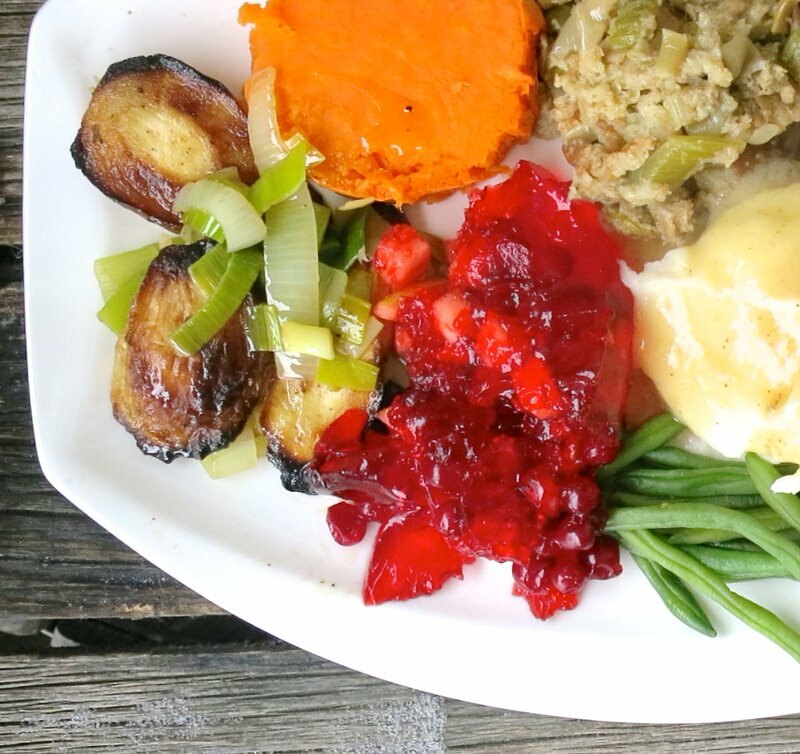 We love the sparkle, bounce, and sassy little-unexpected burst of tart Partridgeberry zest that pairs so perfectly with our turkey dinner. Thank you, once again, Emily, for providing me with enough berries for the Christmas Salad, the Easter Salad and the Thanksgiving Salad to come. Emily’s GetJoyFull “Fill up on Family Time” is a favourite of mine! Below, Cela is foraging Partridgeberries on a trip home to see Nana and GiGi. 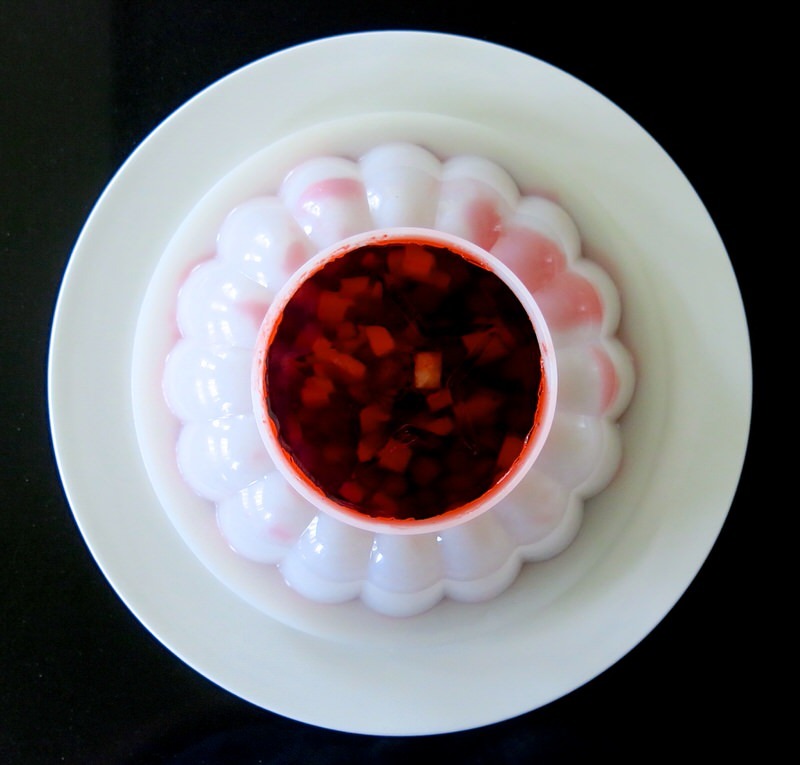 Two cups of boiling water are stirred into the package of Jell-O til completely dissolved and softened. Then I added the vinegar and the 2 cups of cold water. The mixture was still very warm, so into the fridge for 1/2 hour to cool down enough to embrace the frozen berries without shocking the beejeebies out of them. 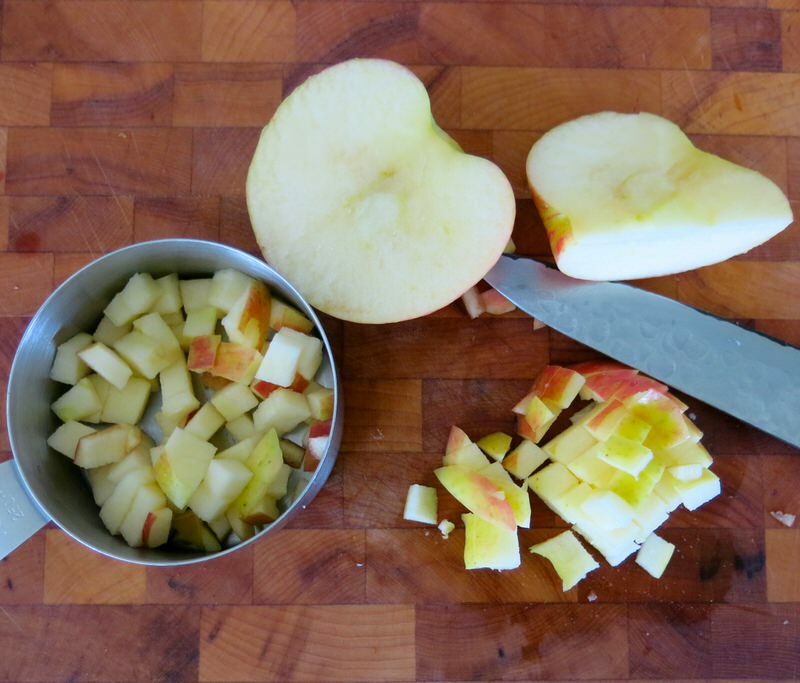 Time to dice the apples. My way of thinking when preparing anything with mixed fruit of vegetables: all ingredients should be of similar size. 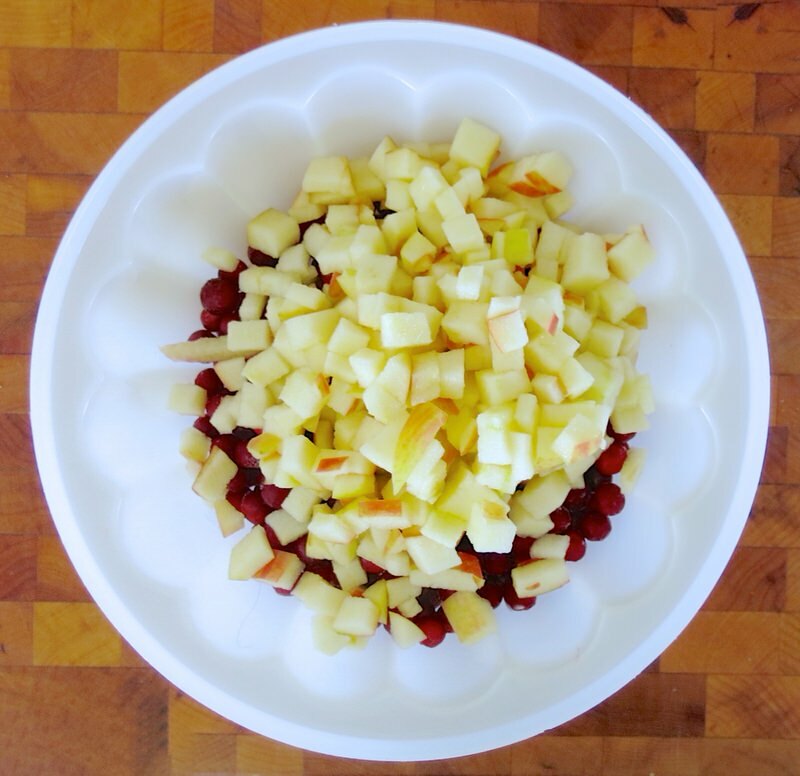 As the berries are small, I diced the apples accordingly. I find this creates a gorgeous visual with equal distribution as well as a lovely mouthfeel. 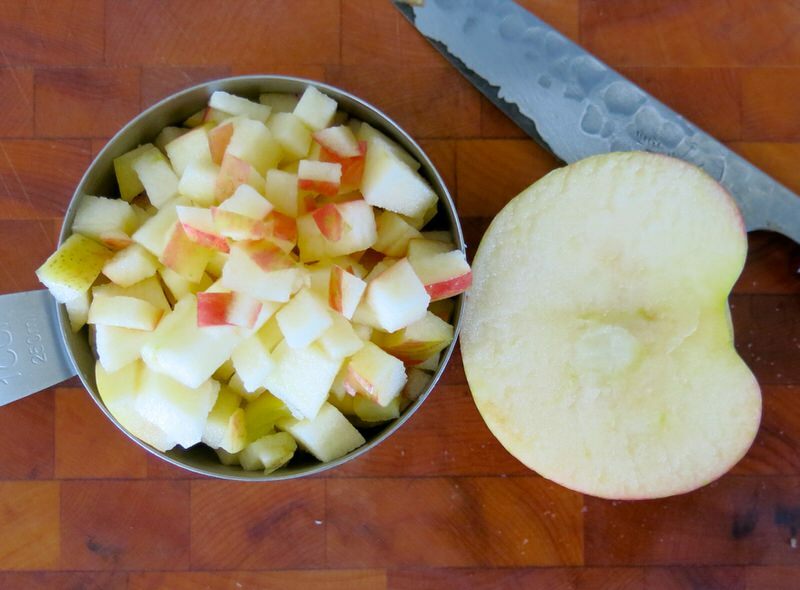 However, one regular apple measured to a full cup and a half. What to do. Hmmm? 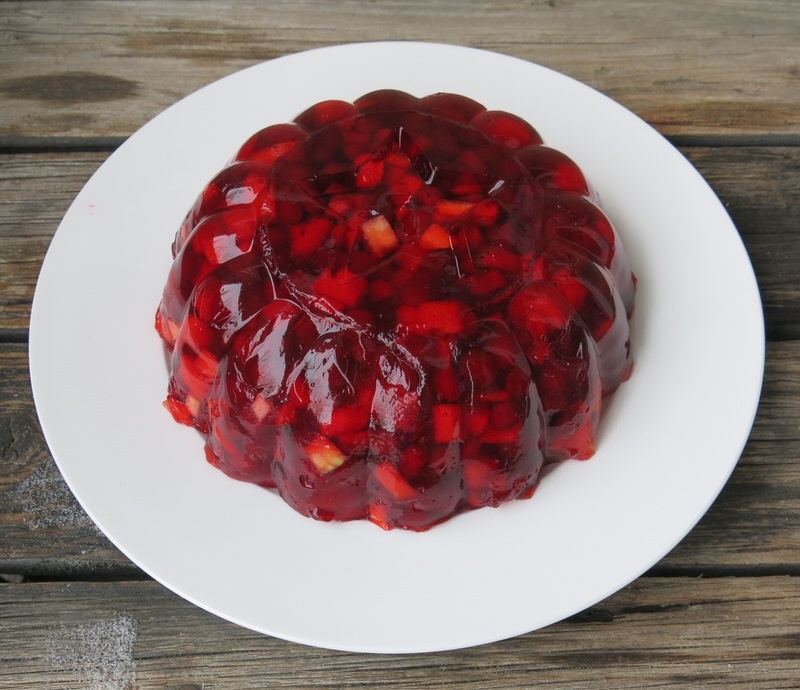 Having made this at Christmas, I had more than my mold would hold; yet I had an 8 cup mould. Not sure how that happened, but I decided to think like a woman in her Newfoundland kitchen, likely 40 years ago when this salad reared its head. 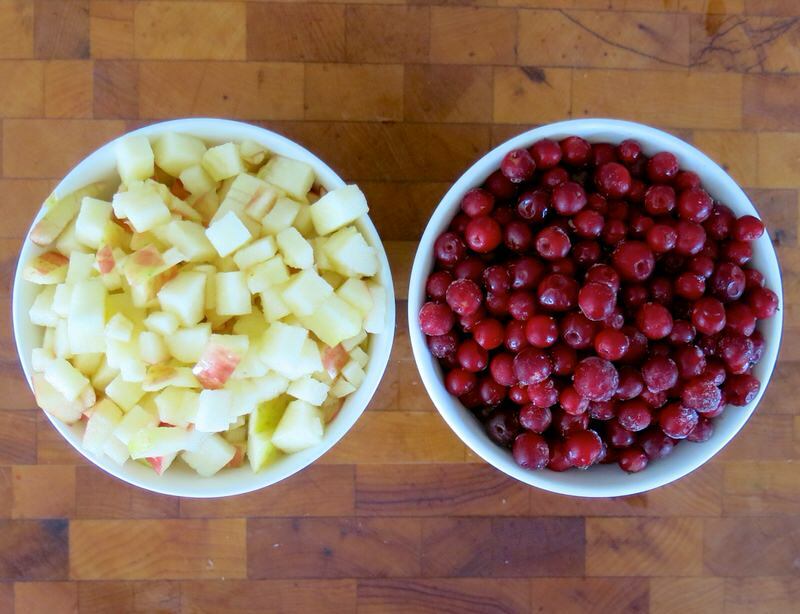 Would I just use 1 cup of each fruit when one apple was diced into a cup and a half? Nope. I added another 1/2 cup of berries. 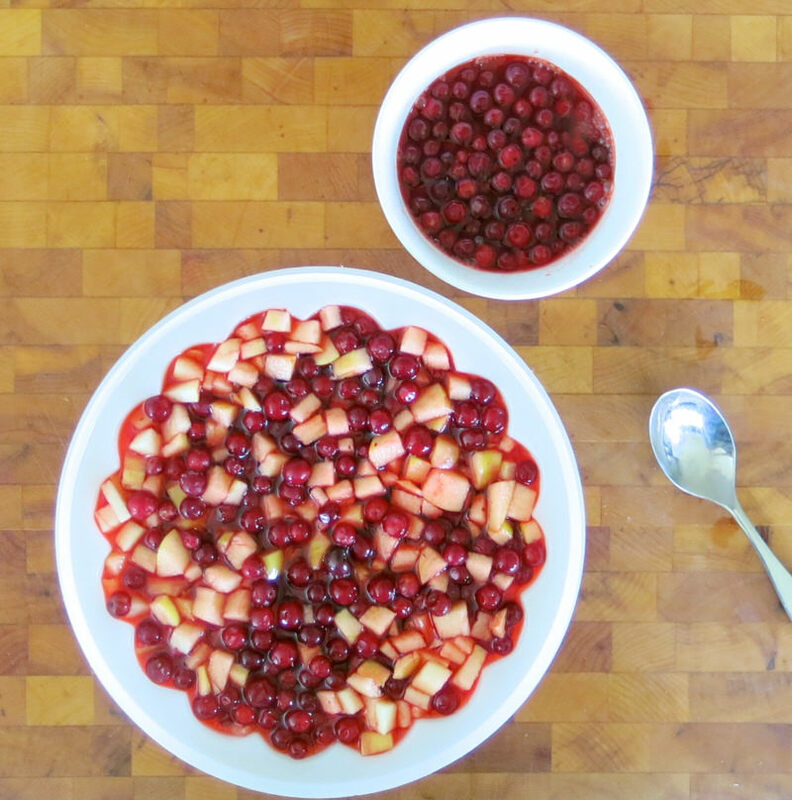 I decided to interpret the recipe as equal portions of apple and berries. See? Similar sizes. Equal portions. 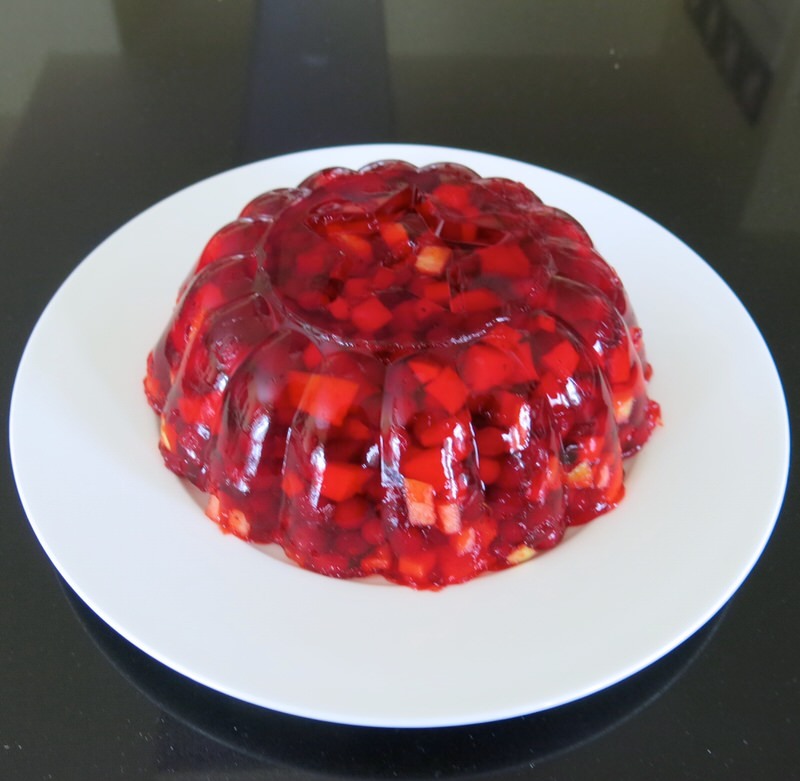 Instead of mixing the fruit with the now cold but not yet thickened Jell-O, I decided to add the fruit to the mold and pour the cool liquid Jell-O over it. Good decision. 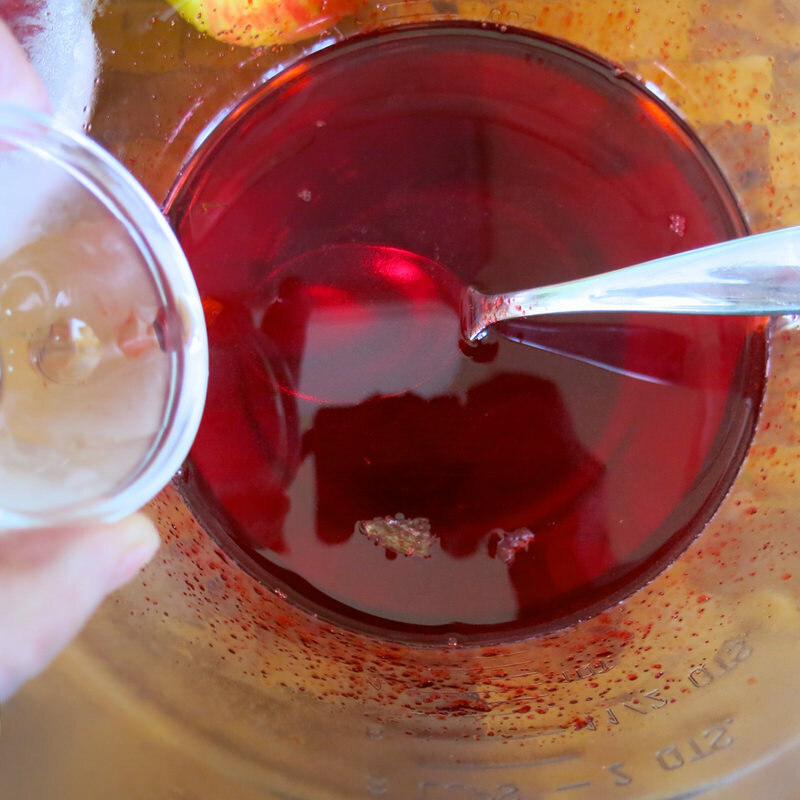 There is plenty of glistening cherry Jell-O, plenty of fruit and about 1/3 cup of leftover liquid. 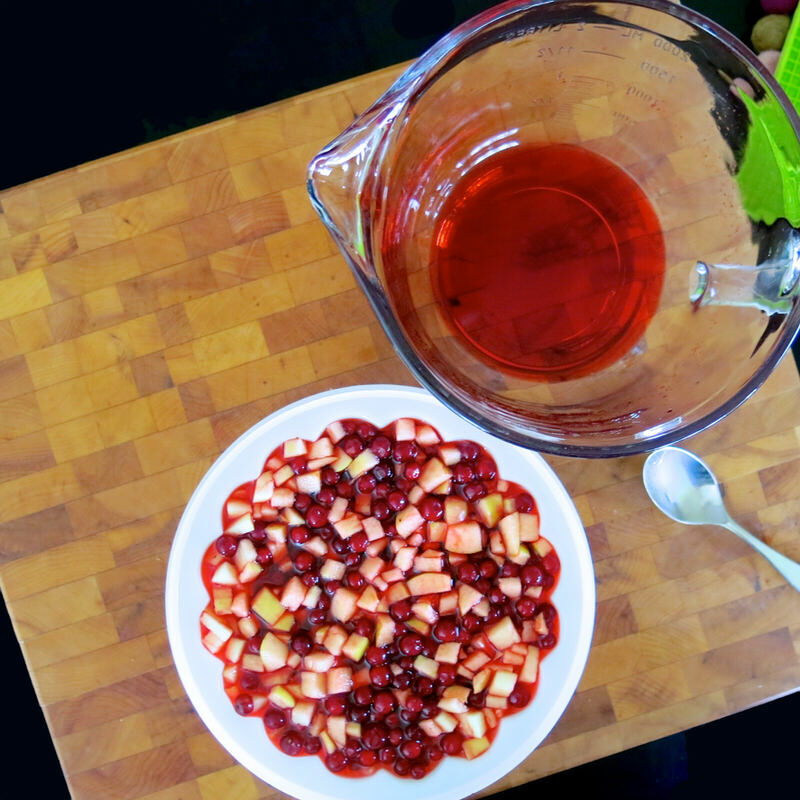 I added a couple of tablespoons of frozen berries to the extra liquid, and refrigerated all, carefully. The mold must be level. It is important to set the timer. 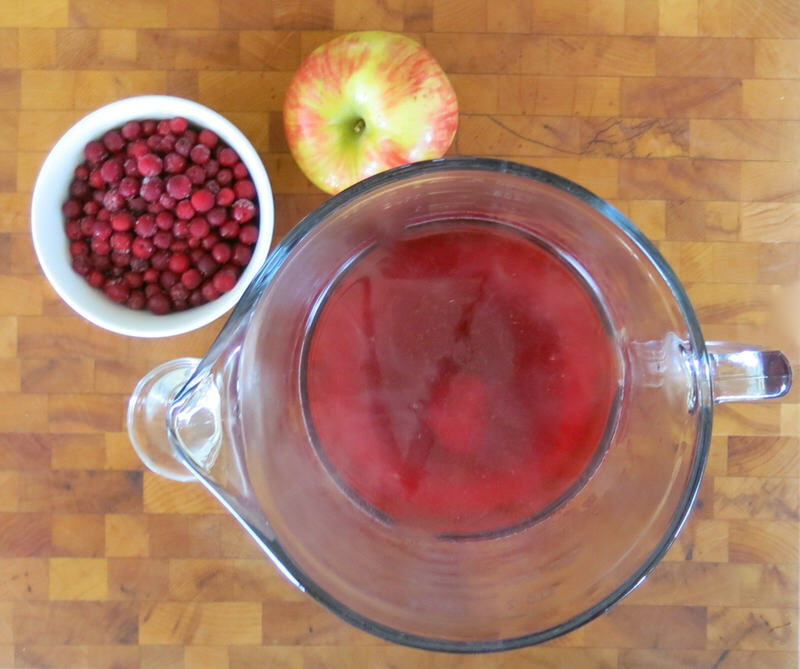 The frozen berries speed up the set and in 10 minutes the mixture needs to be stirred to ensure better suspension of the fruit. One or two more stirs about 5-10 minutes apart to complete that process and then let the salad chill until ready for dinner. 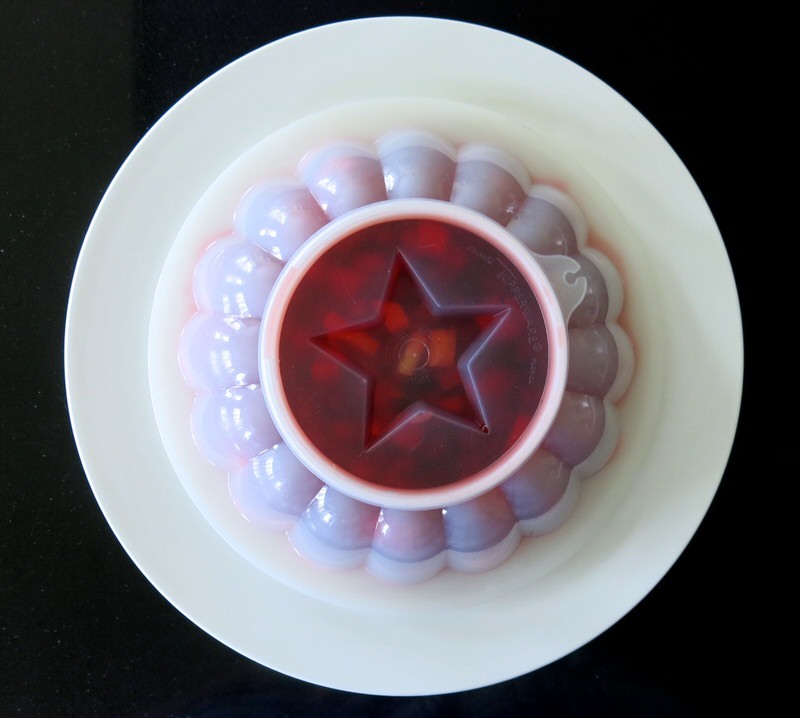 Place a plate on top of the jelly and turn the firm jelly inside of the mold over onto the plate. My mid-1970’s Tupperware mold has a beautiful release. I simply unseal the top, and the entire salad plops onto the plate in relief. Ahhh! So pretty! Mom used her mold so many times in those years, always decorating the middle heart, star, or tree with mayonnaise. Sugared Partridgeberries would be pretty piled in the middle garnished with mint leaves, but I didn’t bother. Our family holiday meals used to be much more festive and lavish. 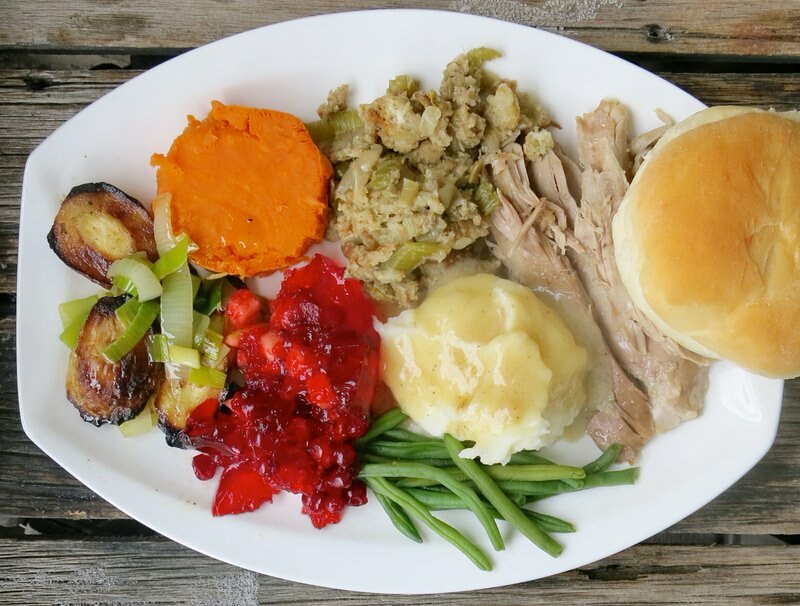 With my dad and sister both gone and my daughter and her family rarely here during the holiday meal, my mom, my daughter, and my husband forgive my lack of lustre and finesse and appreciate, instead, the comfort and informality of really good food with those you love. 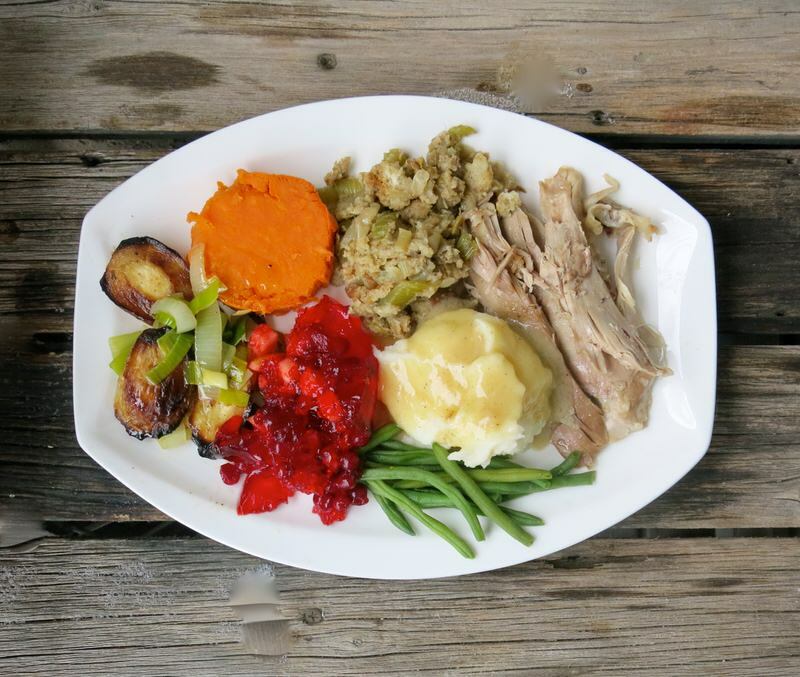 Buffet style is now the modus operandi for our holiday meals these days. We always sit in the dining room at a formally set table at Christmas. Easter and Thanksgiving? Not usually. If there’s just the four of us – no. We have cocktails, always. Mom would have it no other way. Her once a week Gin and Tonic before Sunday Supper is her favourite course of the week, and the more generous pour at a holiday meal is always looked forward to. There are no more appetizers. We can’t eat so much anymore. That used to be such a creative addition to each holiday meal. No more soup course, either. Just the meal followed by some games and a visit with dessert much later. 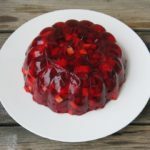 After serving this Partridgeberry Jelly Salad at Christmas, when mom and Ragan spied it on the buffet for this Easter meal, they both expressed approval. That was later followed by those endearing sounds of pleasure not missed a bit by my waiting ears (cocked keenly to capture every “yum”). Homemade cranberries were also on the buffet, but I found the Partridgeberry Salad took their place on the dinner plate. 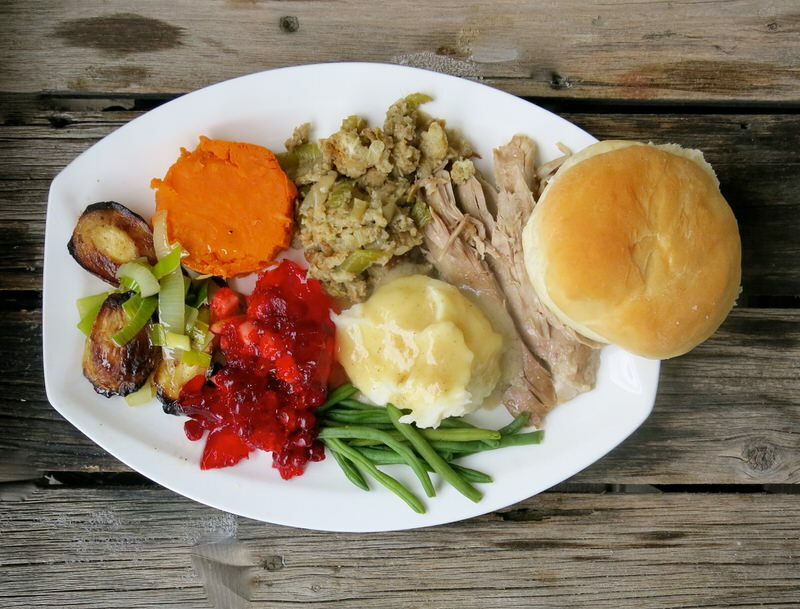 But, the next day, on mom’s homemade prairie buns, turkey with homemade cranberry sauce is an absolute must. Dad’s turkey bun sandwiches are as looked forward to the day after the turkey as the festive meal is the day prior to the holiday! 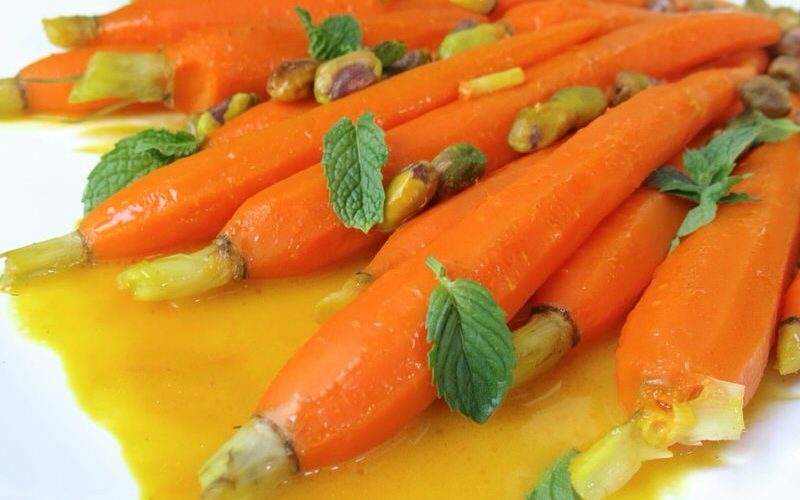 This recipe was given to me by Joy Burt, Emily Mardell's mom. 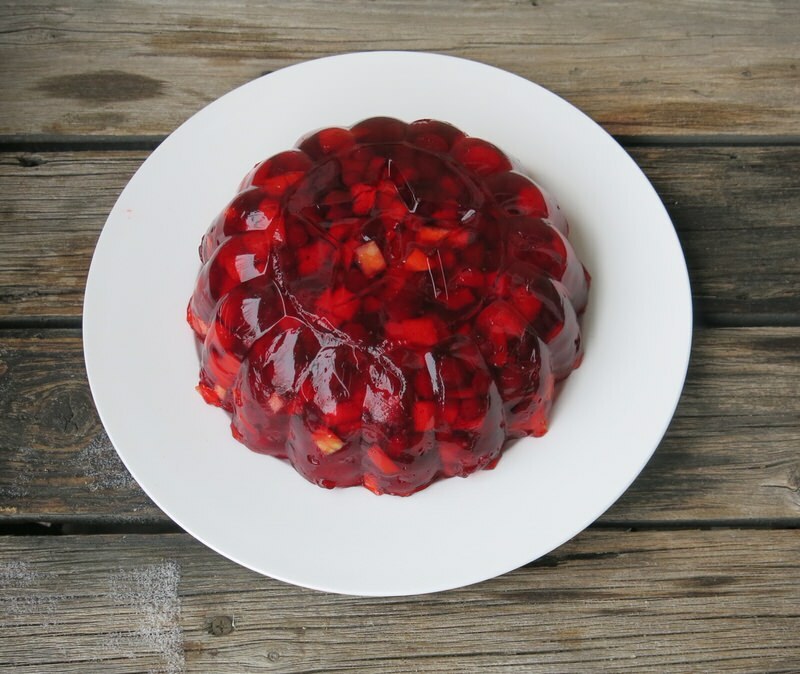 Emily provided the partridgeberries and Joy provided a regional traditional holiday recipe that the family loves. 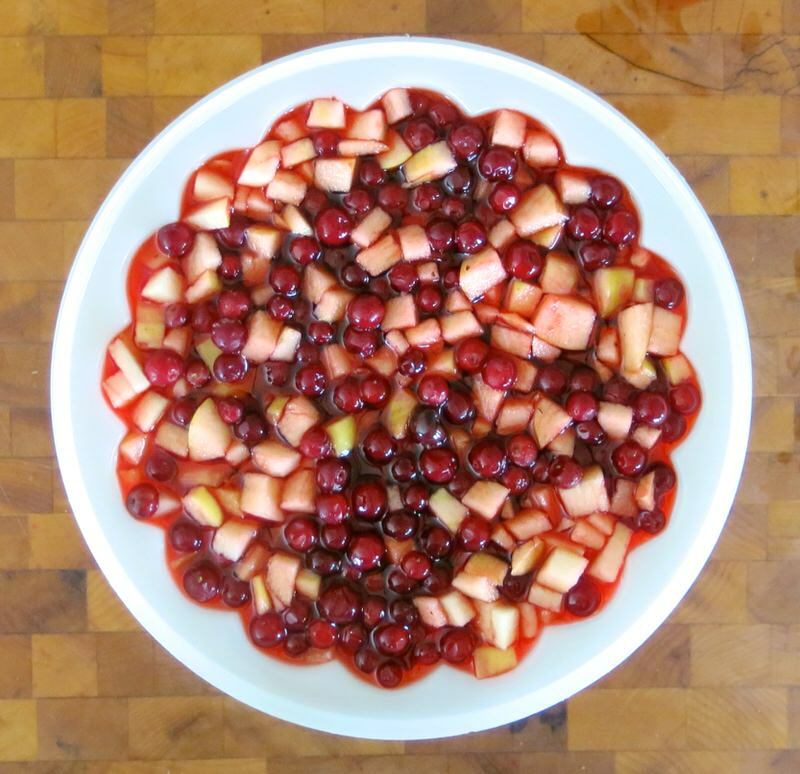 If you can get the berries, this is a delicious celebration of them during holiday season. 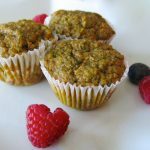 Gramsy’s Healthy Veggie Muffins: Build Strong Minds and Bodies! You silly – I always have to “fight with you” to get you to take home anything! what my Grandmother called them. They grew profusely around our Northern New Hampshire farm. has brought back. Our area was very French Canadian. My Mother was French Canadian, 2nd generation US. Wintergreen berries may look similar and grow in a similar fashion to the partridgeberry but they are definitely not the same berry. 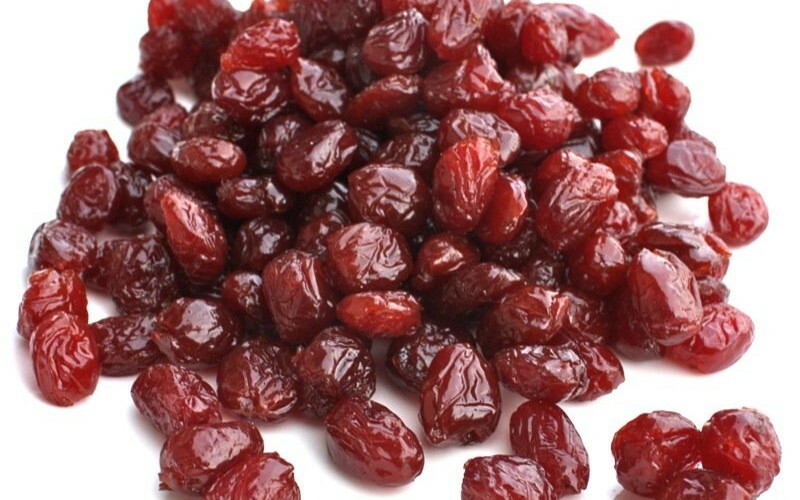 The partridgeberry is similar to a lingonberry and a wintergreen berry is also called a teaberry. One is fruity and tart and the other spicy and menthol. A blueberry is as different from a Saskatoon berry as a strawberry is from a raspberry. You just have to taste them. The flavour is nothing alike. They are both delicious, but I am in Saskatoon country, so I grew up with them and prefer them in all baking. 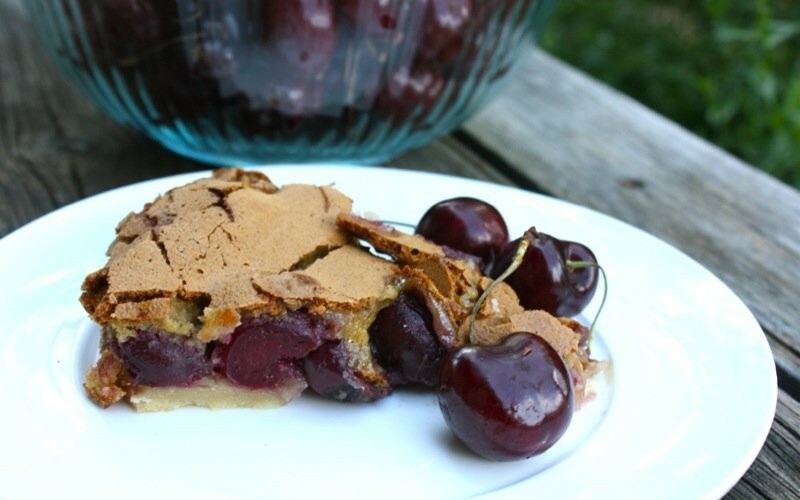 Farmed Blueberries are usually better raw but that is only because farmed Saskatoon berries are not wildly grown and definitely not sold in supermarkets. They are fabulous raw, too. The wild Saskatoons are the best for cooking and a little less juicy raw, though still delicious. Depends upon the amount of water in the wild that season. 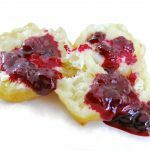 Wild blueberries are now cultivated in the East of Canada and fabulous both raw and cooked… but I remain a Saskatoon berry gal with a love for all Canadian berries… all berries, actually! I am touched that you have been able to connect with the nostalgia within my stories. My heart is warmed. I have made tortierre. I haven’t written about it as we didn’t grow up with it here in the west and the predominant flavour of cloves in the pie is a bit off-putting for my palate. 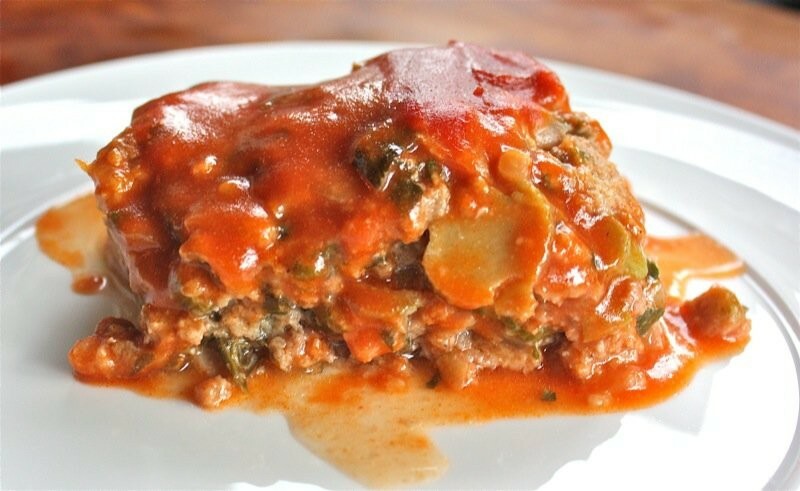 I do have a recipe which is fabulous on my site for the Acadian meat pie – very similar, but different enough. A close cousin, shall we say. Still, don’t make that too often as it wasn’t part of my family repertoire. I do always buy the bloody organic turkeys. 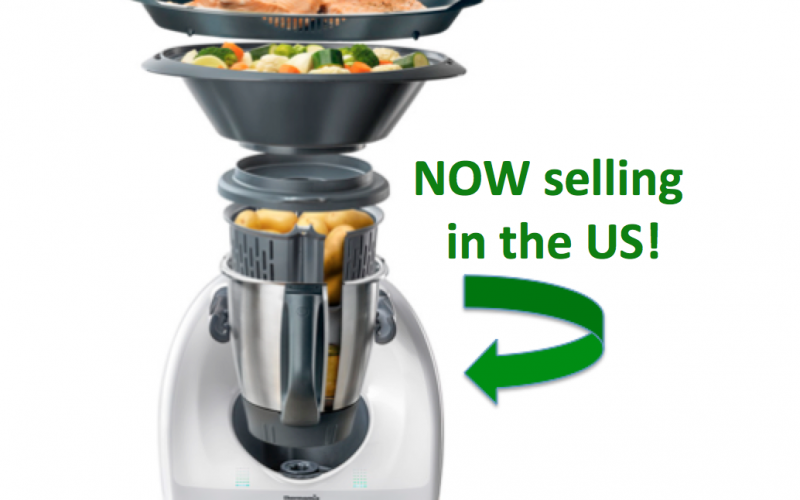 That is why I sell Thermomix machines. Haha. So I can afford the ridiculous price of the turkey 3 times a year. I find it so worth it and get so many meals out of the bird. It is just not an option here, but such irony that we have to pay so much to have a turkey the way everyone used to grow them. Big hug from me to you, MaryAnn!